The flight from KK to Lahad Datu was uneventful. We met our guide (Raybould Edwin Kouju or 'Ray') and two fellow travelers (Ana and Louis Jouault from the English island of Jersey) at the small airport. Both Sarah & I had the same thought when we met Ana and Louis. "Oh no - here's a couple who have probably paid lots to see the rainforest, and they're stuck with our family. Its probably their worst nightmare!" We had been awake since 4:30am to catch the early flight, and the kids were not at their best. In fact, Ana, Louis and Ray were terrific, and we all had a fabulous time for our three days there. The Borneo Rainforest Lodge is located about 80km from Lahad Datu in the heart of a 1000+ sq. km. logging concession managed by the Sabah Foundation and Innovision. The Danum Valley Conservation Area is 'primary forest' (what we would call 'old growth' forest), that has never been logged. The main lodge has a view whose majestic nature and size could not be captured by my camera. Looking over the Segama River, a ridge rises some 120 metres. The forest stretches away from the lodge for maybe half a kilometre as it climbs the ridge. It is like sitting on the stage of an enormous natural amphitheatre. The entire area, starting on the far side of the river bank, is covered by immense trees and vines with every shade of green imaginable. We spent many hours sitting in the open air dining room watching the forest - much like you would watch ocean waves, or a crackling fire. Every so often, you would see the tree branches swaying wildly as a band of red leaf monkeys or long tail macaques moved through the canopy. Guests are housed in small chalets, and each chalet is connected by raised wooden walkways to the main lodge. We were given one chalet with a double and a single bed. The staff put in another two singles and we managed quite comfortably for our two nights. Our first organized activity was a nature walk at 3:00. After lunch, short naps for us parents, and lots of sitting and watching the ridge, we were off (minus Chloe who decided to stay in the chalet and relax). The nature trail is a boardwalk with interpretive signs that Ray explained as we went. We learned about dipterocarp trees and their life cycle, termites, and the importance of the strangling fig tree as a food source for primates and other wildlife. We also got to go on the canopy walk - a suspended cable walkway between two large dipterocarp trees - it must have been over 100 feet off the ground in places. We did not see much wildlife, but like the lodge, the view was spectacular. After supper, we all (Chloe included) went on a night drive. We sat on benches in the back of a pick up truck while the guide used a spotlight to look for wildlife. We did not see much - frogs and two sleeping hornbills (big birds). I managed to throw my back out - I had strained something while kayaking in the surf in Kota Kinabalu, and now I made it much worse sitting in a bumpy pick up truck twisting around to see something. It was to bother me for the next week. We went to bed at 10:00PM - the end of a very long day. Sarah and I thought we would go on the 6:00AM walk on our own the next day while the kids slept in. Reading back, I see that I have not described rainforest noises. There are cicadas that you could set your watch by ( Imperial Cicada's starting daily at 5:30PM). There are Geckos that sounds like dogs (ruff!, ruff!, ruff!, grrrr! ), and other cicada's that sound like vacuum cleaners, not to mention the calls of hundreds of bird species like hornbills and pheasants. Oh - and at 5:30AM, the gibbons loudly proclaim their territories to the world. It woke us up. For those of you who know us, you would be very surprised to hear that the James/ Carlson family were up and ready for the 6:00AM walk before our alarm had sounded - Chloe included. We went to the canopy trail again - looking spectacular with the mist rising up into the trees. We came across a band of red leaf monkeys and stopped to watch them travel past us. Before describing our next walk, I should talk about leeches as they play a leading role. As the joke goes, Borneo has no tigers ... except for Tiger Beer and Tiger Leeches. Leeches are inchworm size creatures that stay on low lying bushes and the forest floor waiting for unsuspecting warm blooded creatures to pass by. They then latch on for a meal of blood, letting go when they are fully engorged. Ray demonstrated by holding his hand out to one and we watched it struggle and stretch to reach the source of warmth. There are two types of leeches - neither are poisonous or carry disease. You cannot feel when brown leeches bite as they inject a kind of anesthetic when they attach. The tiger leech has a small bite that you can feel. Both inject an anti-coagulant, so the blood continues to flow for some time after the leech drops off. Unlike the old wives tale, you can pull leeches off in mid-feed in a panic, although its easier to nonchalantly roll it around until it lets go, and then flick it off. Leeches will crawl to places of maximum warmth before biting. The ankles are the most common places for bites since the leeches generally are quite low when you pick them up, and they can also bite through the loose weave sock material. The lodge sells 'leech socks' which are a close weave 'Christmas stocking' that you wear under your shoes and over your pants. The lodge also provides 'blood donor certificates' to any leech victims as a funny remembrance of the Borneo Jungle. Throwing caution to the wind, we didn't buy the leech socks for $6/pr - choosing instead to tuck our pants into our socks. On our first 'real' jungle walk, we went on the path up to the top of the ridge overlooking the lodge. It was a pleasant walk and brought us not only to the lookout, but the ancient burial ground of the river tribes that lived here centuries ago. We saw a group of long tail macaques about 30 feet from us, and we saw ants that must have been one inch long. Near the top, we stopped for a water break. When checking ourselves for leeches, Mark noticed something that looked like a round piece of dirt on his sock - he flicked it off and immediately his sock turned red. It had been a brown leech, and judging by its size, it was full. Mark had no idea it was on him. He continued to bleed for the next hour or so turning half his sock red. Our first kid was in the leech club! On our way down from the lookout (superb view by the way), we stopped at the 'Jacuzzi pool', a natural rock pool fed by a mountain steam. For the first time in months, we actually had a refreshingly cold swim. Another group arrived, so we got out to let them swim. Heather found a leech on her bathing suit, which she cleverly flicked towards Mark. Shortly afterwards, Mark found a leech on his leg and pulled it off (we're not sure if this was Heather's leech - I think it was, but luckily Mark does not). Then Chloe found a leech on her. Pandemonium! Our formerly budding entomologist lost all sense of reason. She ran to me and jumped up with a blood curdling scream. My back was hurting so I put her down and she jumped up on Sarah. The leech was between Chloe's toes and she was kicking both feet as hard and fast as she could, screaming all the while. The guides and about 15 people were all watching. I was trying to get the leech off, but it took a while because Chloe refused to stop kicking her feet. When I was sure it was off, I managed to hold on to Chloe's foot and show her that it was gone. Unfortunately there was the tiniest fleck of blood between her toes, and the kicking and screaming started all over again. Ana came to the rescue. She spread her towel over the rocks and got Chloe to sit beside her calmly while we finished getting dressed. I am pleased to report that Chloe, after about half an hour, could not remember which foot had been bitten. She walked back to the lodge with the rest of us no worse for wear. As a result, all three kids are in the Leech club and have their certificates to prove it. That afternoon, we set off to walk up the river. We were in bathing suits and sandals (even Chloe despite her fear of leeches) and carrying rubber inner tubes. After about a kilometre, we launched the tubes and floated back to the lodge. As usual, the scenery was spectacular. We finally saw an orang-utan when we got back. It was in the trees right next to the lodge. For some time, it seemed that it would be spending the night in the tree right next to our chalet, however it slipped away when we were at dinner. This was our last dinner at Danum. Before supper, Louis taught the kids card tricks (which they continue to show everyone - even as I write this almost two weeks later). We had a very pleasant supper with Ana and Louis, and Jackie and Barry Robinson. Jackie and Barry had been here for five days and had been very nice to the kids - lending binoculars and taking Mark fishing. We went on a night walk and saw lots of insects - stick bugs, centipedes, millipedes and leeches. Louis showed off his pilot eyes by finding many small insects in the darkness. Ray says the Gibbons were as noisy as always... but the kids slept in and it was the alarm clock that woke Sarah & I up the next morning. We walked downstream along the river before breakfast and saw another band of monkeys. Louis amazed everyone again by seeing the distant arm of an orang-utan sticking out from its nest, but that was all that it would show. We went on the canopy walk again and saw termites marching up the tree. They were marching seven wide and the line of termites extended as far down and as far up as we could see (probably 50 metres). You can see in the soldiers on the sides of the column guarding the workers (or maybe just making sure they work!). Without exaggerating, there must have been a million of them all very focused on their task. After breakfast, we had our last walk along another trail (no Chloe again). We had a very close look at a male Great Argus Pheasant. This peacock sized bird is the largest land bird in Borneo. It was trying to attract a mate by calling and preparing a dancing ground right in the middle of the pathway. Just before leaving, Sarah spotted a water monitor on the beach near where we had been tubing. 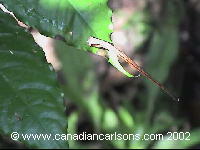 It was only about 3 feet long (small for a monitor) and quite timid - we could not get very close to get a good picture. There was less wildlife at Danum than I expected. Perhaps a better way of saying it is that there is lots of wildlife, it is just difficult to spot with all the trees. However, the scenery is absolutely stunning and when we did find wildlife, it was exciting. We had seen all the animals much closer in zoos... but it is not the same as seeing the real thing. Photography was difficult - most large animals were partially hidden by leaves. If they were not hidden, they were typically at the top of the tree and backlit by the sky. As a result, I do not have a lot of good pictures other than the small bugs like this tractor millipede. I think video turned out better than still pictures because you hear the sound and see the movements. Would we do it again? It was very expensive, but it was certainly something we had to do once in our lives. Perhaps Mark summed it up best when he said "That was cool". The ultimate compliment from a 13 year old! After lunch, we left the lodge to return to Lahad Datu. The mini bus dropped us off at the bus station (it was really just a parking lot). Ana and Louis continued to the airport for their return flight to KK. We chartered a mini-bus for 100RM (about $40) to take all of us the 180 km to the Labuk Bed and Breakfast in Sandakan. Strangely, the driver let on three more people even though we paid for a private bus - he introduced them as his uncle, brother and nephew. They were a nice enough group and we had a good trip.